Attacq Limited (Attacq), the JSE listed property company developing Waterfall City and Waterfall Logistics Hub, hosted an official ground-breaking ceremony today, to welcome international medical devices company Zimmer Biomet to Waterfall Distribution Campus. Zimmer Biomet is a worldwide leader in the design, manufacture and marketing of orthopaedic reconstructive products, sports medicine, biologics, extremities and other related surgical products. They collaborate with healthcare professionals around the globe to advance the pace of innovation, and their products and solutions help treat patients suffering from disorders of, or injuries to, bones, joints or supporting soft tissues. “The pace of innovation within the medical field is simply outstanding. Firms like Zimmer Biomet are pushing the boundaries of medical science and reimagining what is possible using technology. We are extremely proud to have them here at Waterfall and hope that our strategic location and ease-of-access to national logistics routes make it easier for their much-needed products to reach the people who need them” said Melt Hamman, Chief Executive Officer of Attacq. The firm will move into an approximately 4 000 m² consolidated office and warehouse facility designed to improve distribution and storage proficiency, as well as allow for cross-functional teams and improved efficiencies. “As a multi-national company that prides itself in being a leader in our field, we are excited about the move as it will provide us with room to grow our business. We are proud to be associated with Waterfall and believe the location and ease of access to Waterfall Distribution campus will be highly beneficial to our business,” said Steven Orange, Zimmer Biomet, Vice President Northern Europe. 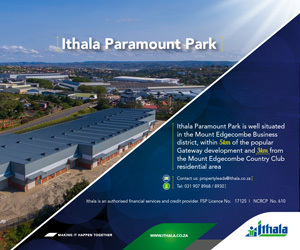 The development is a joint venture between Attacq and Sanlam Properties. “We are excited about this new chapter in our journey with Attacq and look forward to seeing what new opportunities will come from this partnership,” says Andre Rheeder, CEO of Sanlam Properties. Waterfall Distribution Campus’s combination of visibility and accessibility along with its proximity to the Mall of Africa, remains a key driver to ensuring continuous growth in retail, office and mixed-use, industrial and hotel activities in the Waterfall node.